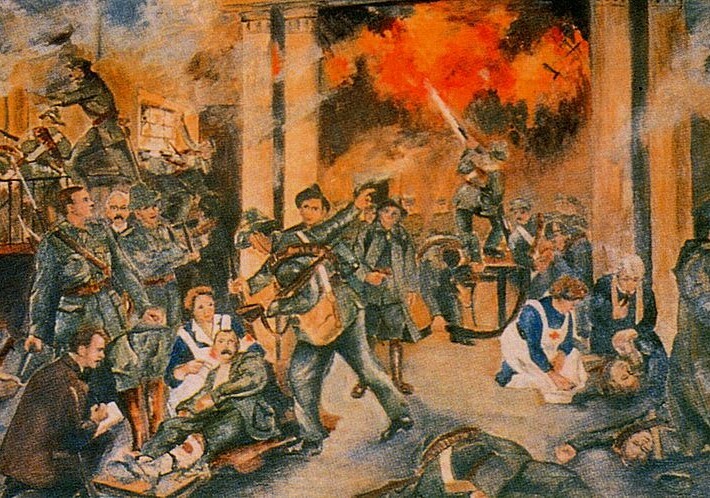 The Easter Rising (Irish: Éirí Amach na Cásca), was an insurrection staged in Ireland during Easter Week, 1916. 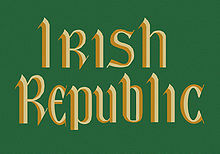 The Rising was mounted by Irish republicans with the aims of ending British rule in Ireland and establishing an Irish Republic. It was the most significant uprising in Ireland since the rebellion of 1798. Organised by the Military Council of the Irish Republican Brotherhood, the Rising lasted from Easter Monday 24 April to 30 April 1916. Members of the Irish Volunteers, led by schoolteacher and barrister Patrick Pearse, joined by the smaller Irish Citizen Army of James Connolly, along with 200 members of Cumann na mBan, seized key locations in Dublin and proclaimed an Irish Republic independent of Britain. There were some actions in other parts of Ireland but, except for the attack on the RIC barracks at Ashbourne, County Meath, they were minor. The Rising was suppressed after seven days of fighting, and its leaders were court-martialled and executed, but it succeeded in bringing physical force republicanism back to the forefront of Irish politics. In the 1918 General Election, the last all-island election held in Ireland, to the British Parliament, Republicans won 73 seats out of 105, on a policy of abstentionism from Westminster and Irish independence. This came less than two years after the Rising. In January 1919, the elected members of Sinn Féin who were not still in prison at the time, including survivors of the Rising, convened the First Dáil and established the Irish Republic. The British Government refused to accept the legitimacy of the newly declared nation, leading to the Irish War of Independence. The Supreme Council of the IRB met on 5 September 1914, a month after the United Kingdom declared war on Germany. At this meeting they decided to stage a rising before the war ended and to accept whatever help Germany might offer. Responsibility for the planning of the rising was given to Tom Clarke and Sean Mac Dermott. The Irish Volunteers, the smaller of the two forces resulting from the September 1914 split over support for the British war effort, set up a “headquarters staff” that included Patrick Pearse as Director of Military Organisation, Joseph Plunkett as Director of Military Operations and Thomas MacDonagh as Director of Training. Eamonn Ceant was later added as Director of Communications. In May 1915 Clarke and MacDermott established a Military Committee within the IRB, consisting of Pearse, Plunkett and Ceannt, to draw up plans for a rising. This dual rôle allowed the Committee, to which Clarke and MacDermott added themselves shortly afterwards, to promote their own policies and personnel independently of both the Volunteer Executive and the IRB Executive—in particular Volunteer Chief of Staff Eoin MacNeill, who was opposed to a rising unless popular support was secured by the introduction of conscription or an attempt to suppress the Volunteers or its leaders, and IRB President Denis McCullough, who held similar views. IRB members held officer rank in the Volunteers throughout the country and would take their orders from the Military Committee, not from MacNeill.Plunkett had travelled to Germany in April 1915 to join Roger Casement. Casement had gone there from the United States the previous year with the support of Clan na Gael leader John Devoy, and after discussions with the German Ambassador in Washington, count von Bernstorf, to try to recruit an “Irish Brigade” from among Irish prisoners of war and secure German support for Irish independence. Together Plunkett and Casement presented a plan which involved a German expeditionary force landing on the west coast of Ireland, while a rising in Dublin diverted the British forces so that the Germans, with the help of local Volunteers, could secure the line of the River Shannon. James Connolly, head of the Irish Citizen Army (ICA), a group of armed socialist trade union men and women, was unaware of the IRB’s plans, and threatened to start a rebellion on his own if other parties failed to act. If they had gone it alone, the IRB and the Volunteers would possibly have come to their aid, however the IRB leaders met with Connolly in January 1916 and convinced him to join forces with them. They agreed to act together the following Easter and made Connolly the sixth member of the Military Committee. Thomas MacDonagh would later become the seventh and final member. In an effort to thwart informers and, indeed, the Volunteers’ own leadership, Pearse issued orders in early April for three days of “parades and manoeuvres” by the Volunteers for Easter Sunday (which he had the authority to do, as Director of Organization). The idea was that the republicans within the organization (particularly IRB members) would know exactly what this meant, while men such as MacNeill and the British authorities in Dublin Castle would take it at face value. 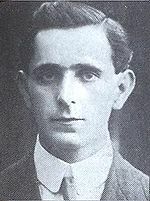 However, MacNeill got wind of what was afoot and threatened to “do everything possible short of phoning Dublin Castle” to prevent the rising.MacNeill was briefly convinced to go along with some sort of action when Mac Diarmada revealed to him that a shipment of German arms was about to land in county Kerry, planned by the IRB in conjunction with Roger casement; he was certain that the authorities discovery of such a shipment would inevitably lead to suppression of the Volunteers, thus the Volunteers were justified in taking defensive action (including the originally planned maneuvers). Casement, disappointed with the level of support offered by the Germans, returned to Ireland on a German U Boat and was captured upon landing at Banna Strand in Tralee Bay. The arms shipment, aboard the German ship Aud — disguised as a Norwegian fishing trawler—had been scuttled after interception by the British navy, after the local Volunteers had failed to rendezvous with it. The following day, MacNeill reverted to his original position when he found out that the ship carrying the arms had been scuttled. 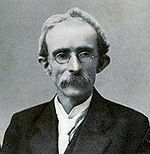 With the support of other leaders of like mind, notably Bulmer Hobson and The O’Rahilly, he issued a countermand to all Volunteers, canceling all actions for Sunday. This only succeeded in putting the rising off for a day, although it greatly reduced the number of Volunteers who turned out. British Naval Intelligence had been aware of the arms shipment, Casement’s return and the Easter date for the rising through radio messages between Germany and its embassy in the United States that were intercepted by the Navy and deciphered in Room 40 of the Admiralty. The information was passed to the Under Secretary for Ireland, Sir matthew nathan, on 17 April, but without revealing its source, and Nathan was doubtful about its accuracy. When news reached Dublin of the capture of the Aud and the arrest of Casement, Nathan conferred with the Lord Lieutenant, Lord Wimborne. Nathan proposed to raid Liberty Hall, headquarters of the Citizen Army, and Volunteer properties at Father Matthew Park and at Kimmage, but Wimborne was insisting on wholesale arrests of the leaders. It was decided to postpone action until after Easter Monday and in the meantime Nathan telegraphed the chief Secretary,Augustine Birrell, in London seeking his approval. By the time Birrell cabled his reply authorising the action, at noon on Monday 24 April 1916, the Rising had already begun. The rebel headquarters was located at the GPO where James Connolly, overal military commander and four other members of the Military Council: Patrick Pearse, Tom Clarke,, Sean Mac Dermottand Joseph Plunkett, were located.After occupying the Post Office, the Volunteers hoisted two republican flags and Pearse read a Proclamation of the Republic. Elsewhere, rebel forces took up positions at the Four Courts, the centre of the Irish legal establishment, at Jacobs Biscuit Factory and Boland’s Mill and at the hospital complex at South Dublin Union and the adjoining Distillery at Marrowbone Lane. Another contingent, under Michal Mallin, dug in on st. Stephens green. However, although it was lightly guarded, Volunteer and Citizen Army forces under Seán Connolly failed to take Dublin Castle, the centre of British rule in Ireland, shooting dead a police sentry and overpowering the soldiers in the guardroom, but failing to press home the attack. The Under-secretary, Sir matthew nathan, was alerted by the shots and helped close the castle gates. The rebels occupied the Dublin City hall and adjacent buildings. They also failed to take Trinity College, which was located in the heart of the city centre and which was defended by only a handful of armed, unionist students. At midday a small team of Volunteers and Fianna members attacked the Magazine Fort in the Phoenix park and disarmed the guards, with the intent to seize weapons and blow up the building as a signal that the rising had begun. They set explosives but failed to obtain any arms. The British military were caught totally unprepared by the rebellion and their response of the first day was generally un-coordinated.Two troops of British cavalry, one at the Four Courts, the other on O’Connell Street, sent out to investigate what was happening, took fire and casualites from rebel forces On Mount Street, a group of reserve volunteer soldiers, stumbled upon the rebel position and four were killed before they reached Beggars Bush Barracks. The only substantial combat of the first day of the Rising took place at the South Dublin Union where a piquet from the Royal Irish regiment, encountered an outpost of Éamonn Ceannt’s force at the north-western corner of the South Dublin Union. The British troops, after taking some casualties, managed to regroup and launch several assaults on the position before they forced their way inside and the small rebel force in the tin huts at the eastern end of the Union surrendered. However, the Union complex as a whole remained in rebel hands. Three of the unarmed Dublin Metropolitan Police were shot dead on the first day of the Rising and their Commissioner pulled them off the streets. Partly as result of the withdrawal of the police, a wave of looting broke out in the city centre, especially in the O’Connell Street area. A total of 425 people were arrested after the Rising for looting. Lord Wimborne, the Lord Lieutenant, declared martial law on Tuesday evening and handed over civil power to Brigadier-General W H M Lowe. British forces initially put their efforts into securing the approaches to Dublin Castle and isolating the rebel headquarters, which they believed was in Libert hall. The British commander, Lowe, worked slowly, unsure of the size of the force he was up against, and with only 1,269 troops in the city when he arrived from the Curragh camp in the early hours of Tuesday 25 April. City Hall was taken from the rebel unit that had attacked Dublin Castle on Tuesday morning. By the end of the week, British strength stood at over 16,000 men. Their firepower was provided by field artillery summoned from their garrison at Athlone which they positioned on the northside of the city at Phibsborough and at Trinity College, and by the patrol vessel helga, which sailed up the Liffey, having been summoned from the port at Kingstown. On Wednesday, 26 April, the guns at Trinity College and Helgashelled Liberty Hall, and the Trinity College guns then began firing at rebel positions, first at Boland’s Mill and then in O’Connell Street. The principal rebel positions at the GPO, the Four Courts, Jacob’s Factory and Boland’s Mill saw little combat. The British surrounded and bombarded them them rather than assault them directly. One Volunteer in the GPO recalled, “we did practically no shooting as there was no target”. Similarly the rebel position at St. Stephen’s Green, held by the Citizen Army under Michael Mallin, was made untenable after the British placed snipers and machine guns in the Shelbourne Hotel and surrounding buildings. As a result, Mallin’s men retreated to the Royal College of Surgeons building where they remained for the rest of the week. However, where the insurgents dominated the routes by which the British tried to funnel reinforcements into the city, there was fierce fighting. Reinforcements were sent to Dublin from England, and disembarked at Kingstown on the morning of 26 April. Heavy fighting occurred at the rebel-held positions around the Grand canal as these troops advanced towards Dublin. The Sherwood Foresters were repeatedly caught in a cross-fire trying to cross the canal at Mount Street. Seventeen Volunteers were able to severely disrupt the British advance, killing or wounding 240 men. Despite there being alternative routes across the canal nearby, General Lowe ordered repeated frontal assaults on the Mount Street position. The British eventually took the position, which had not been reinforced by the nearby rebel garrison at Boland’s Mills, on Thursday but the fighting there inflicted up to two thirds of their casualties for the entire week for a cost of just four dead Volunteers. The rebel position at the South Dublin Union (site of the present day St James Hospital) and Marrowbone Lane, further west along the canal, also inflicted heavy losses on British troops. The South Dublin Union was a large complex of buildings and there was vicious fighting around and inside the buildings. Cathal Brugha, a rebel officer, distinguished himself in this action and was badly wounded. By the end of the week the British had taken some of the buildings in the Union, but others remained in rebel hands. British troops also took casualties in unsuccessful frontal assaults on the Marrowbone Lane Distillery. The third major scene of combat during the week was at North King Street, behind the Four Courts, where the British, on Thursday, tried to take a well-barricaded rebel position. By the time of the rebel headquarter’s surrender, the South Staffordshire Regiment under Colonel Taylor had advanced only 150 yeards down the street at a cost of 11 dead and 28 wounded. The enraged troops broke into the houses along the street and shot or bayonetted 15 male civilians whom they accused of being rebel fighters. Elsewhere, at Portobello Barracks, an officer named Bowen Colthurst summarily executed six civilians, including the pacifist nationalist activist, Francis-Sheehy Skeffington. These instances of British troops killing Irish civilians would later be highly controversial in Ireland.